NEEDHAM, MA. – April 20, 2005 - PTC (Nasdaq: PMTC), the Product Development Company™, today announced Pro/ENGINEER 64-bit support for Windows XP Professional x64 Edition on HP workstations with 64-bit Intel® Xeon™ processors. Pro/ENGINEER is a 3D product design solution that helps companies develop detailed, intuitive and realistic digital product representations. The 64-bit architecture drastically reduces hardware memory restrictions, enabling users to create, manage, retrieve and visualize larger and more complex assemblies. PTC worked closely with HP and Intel to develop a natively ported 64-bit version of Pro/ENGINEER. The new version allows users to take advantage of the massive amount of addressable memory available on the HP workstations based on 64-bit Intel Xeon processors with best-in-class application performance. Pro/ENGINEER has displayed no limit to the size or complexity of the assemblies that it can handle. The only limitation has been the maximum amount of memory that could be managed by 32-bit operating systems. 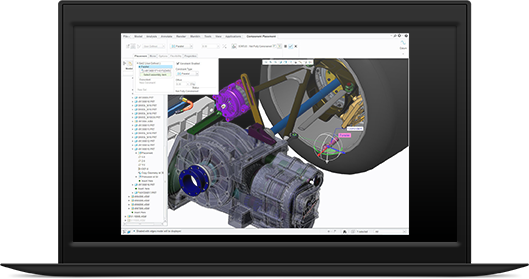 With this restriction removed, customers can work more effectively on the most demanding engineering and design challenges, with increased productivity associated with the ability to create, manage, retrieve, and visualize assemblies of any size or complexity. “64-bit Intel Xeon processor-based platforms are becoming the new industry standard helping users to achieve new levels of performance and reliability for their most demanding applications,” said Jerry Braun, product line manager for Intel’s Digital Enterprise Group. “HP is the first company to deliver certified workstations for PTC Pro/ENGINEER utilizing 64-bit Intel Xeon processors," said Jim Zafarana, vice president of Worldwide Marketing for Workstations at HP. "By working closely with key customers to test this new solution, PTC customers can confidently take advantage of our new workstation features like increased memory capabilities that enable engineers to work with larger assemblies, helping them reduce their error risk and improve their time to market." Pro/ENGINEER Wildfire 2.0 64-bit is scheduled to be available in mid-May.